In the scone world, the only thing I can imagine better than a Zingerman’s scone is a miniature Zingerman's scone. They're still made with fresh butter, cream and just enough organic flour to hold them together, but now they're half the size, which makes them fit into life in all sorts of new ways. They stash easily in desk drawers. In glove compartments. In jacket pockets. Let's not forget the guilt got cut by half too—not that anyone's counting. 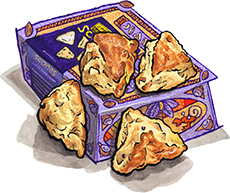 The box contains four total scones in a mix of flavors: two currant, one ginger, and one lemon. "The scones are so authentic they would make an Englishman weep with joy."